Did you ever just feel like you need to down tools and get away? Just twenty four hours away from the hustle and bustle of life can do wonders for recharging your batteries and I have found the perfect place to do this. Somewhere away from the madding crowds where you can take a walk in manicured gardens before enjoying sumptuous food. 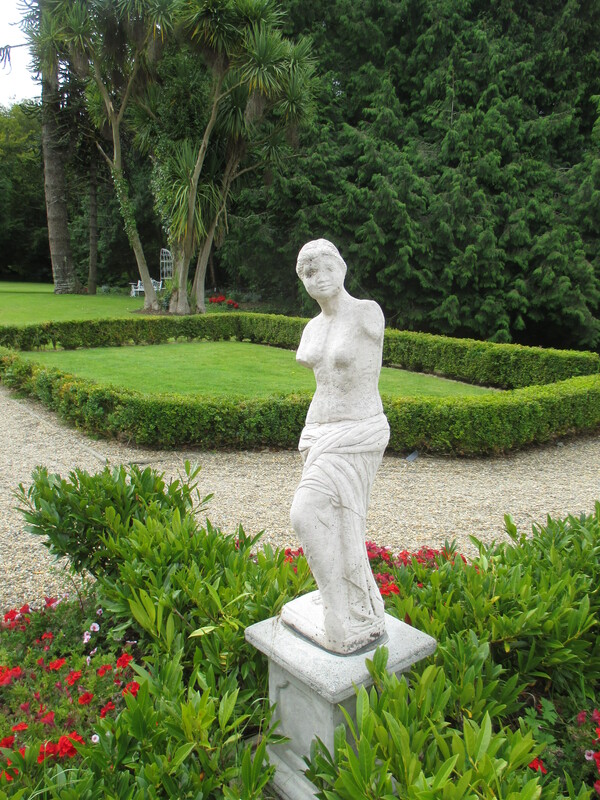 I have found Faithlegg House Hotel nestling in the Waterford countryside. Surrounded by an 18 hole golf course, Faithlegg House oozes tranquillity and charm. This centuries old mansion provides modern facilities encased in historical splendour. High ceilings, sash windows and crystal chandeliers create an ambience for dining that just draws you in and washes away your worries. 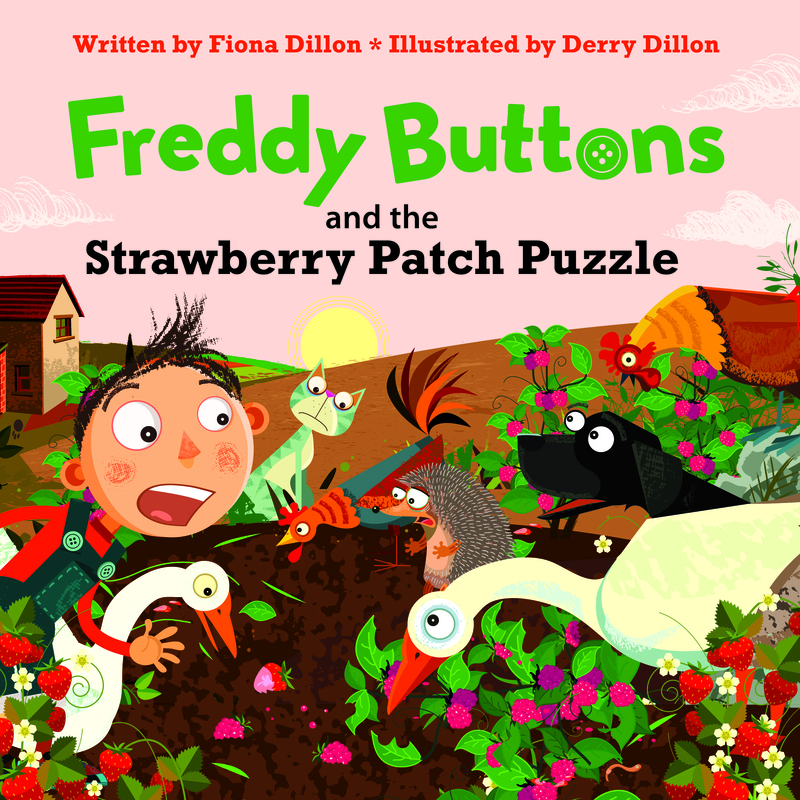 Head chef Jenny Flynn has put together a menu which is both imaginative and packed with local Irish produce. The starters ranged in price from €7.95 (Cream cauliflower soup with crumbed hazelnuts and caramelized apple) to €12.50 (Carpaccio of Beef with horseradish yogurt, rocket, extra virgin olive oil and parmesan. 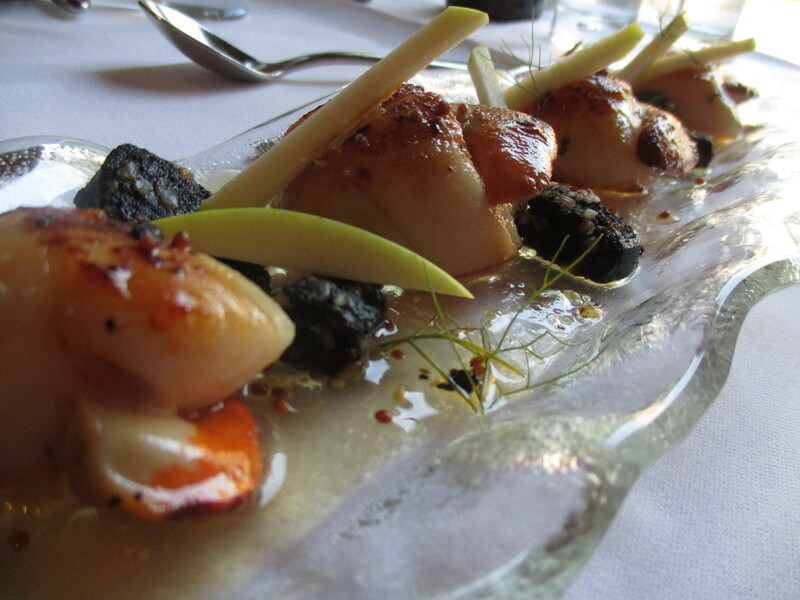 I had the Pan Seared Scallops with apple, black pudding, local cider and mustard vinaigrette (€12.50) and the scallops were cooked to perfection with the cider adding a deliciously sweet element to the dish. 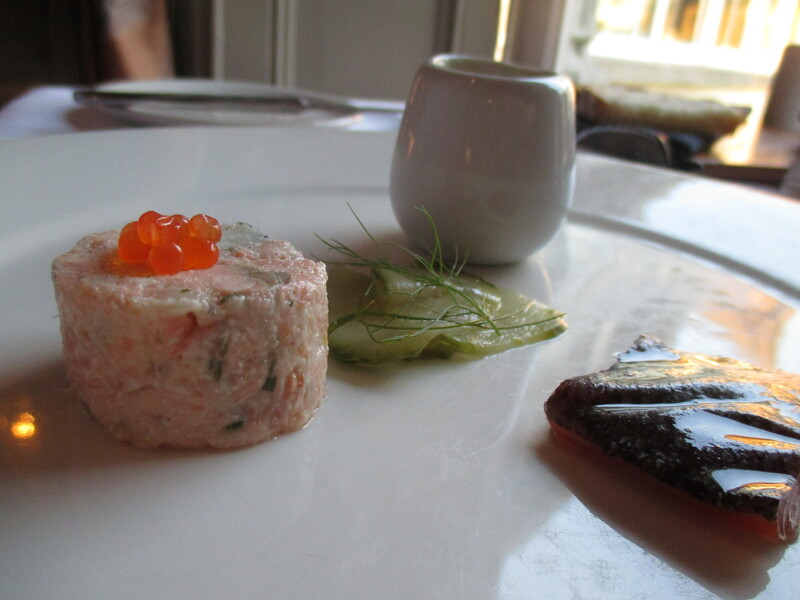 Mr Dillon stuck with one of his favourite producers and thoroughly enjoyed the Goatsbridge Trout offering of trout gravadlax and rillette, smoked trout veloute and pickled cucumber (the veloute could have been a tad smokier, but the texture was perfect). Let me add at this stage that the servers were excellent – attentive (but not overly so), well-mannered and courteous. Main course prices ranged from €21 (Hand-made pasta with roast squash and Bluebell Falls goats cheese, ginger nut butter, pickled courgette and chervil) to €29 (Oven roasted troncon of turbot with orange and lime confit, cabbage and saffron potatoes. What caught my eye was a Skeghamore duck tasting plate (€28) – duck breast, Muldoons whiskey cherries, confit leg and pan fried fois gras. Meats on a plate rarely make for an aesthetically pleasing dish, but the taste certainly made up for the visuals. Himself opted for the chargrilled fillet of Irish beef (€28) with fondant potato, wild mushroom fricassé, banana shallots and a natural jus. Let’s just say there wasn’t a word out of him – never a bad thing! The beef was cooked to perfection and packed with flavour. This was washed down with an Australian Cabernet Sauvignon (€40). Time passed, twilight turned to darkness and it was time for desserts, ranging in price from €8 for a homemade icecream and sorbet selection to €12.50 for a Wexford strawberry tasting plate. On offer also, was a selection of Irish cheeses served with a quince paste and blaa crisps. 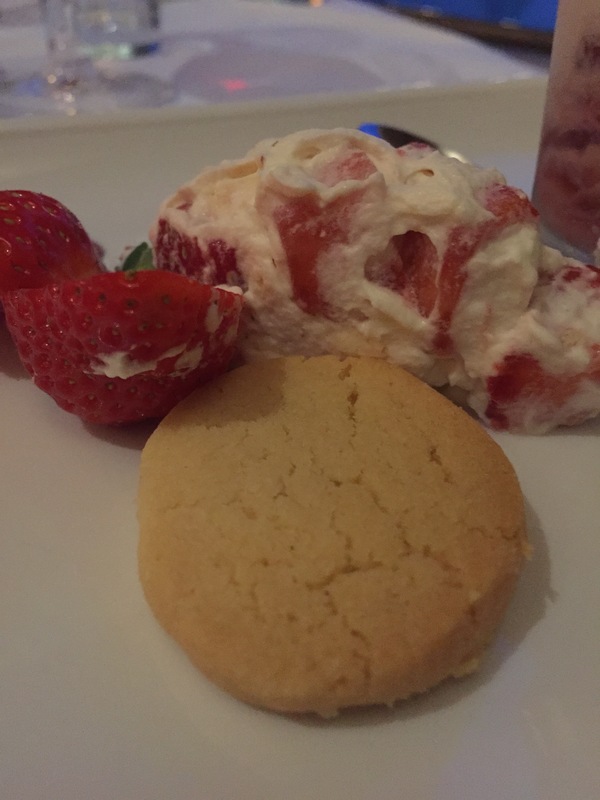 I enjoyed the strawberry tasting plate which consisted of Eton Mess, Sablé biscuit (yum! ), ice cream and pannacotta. 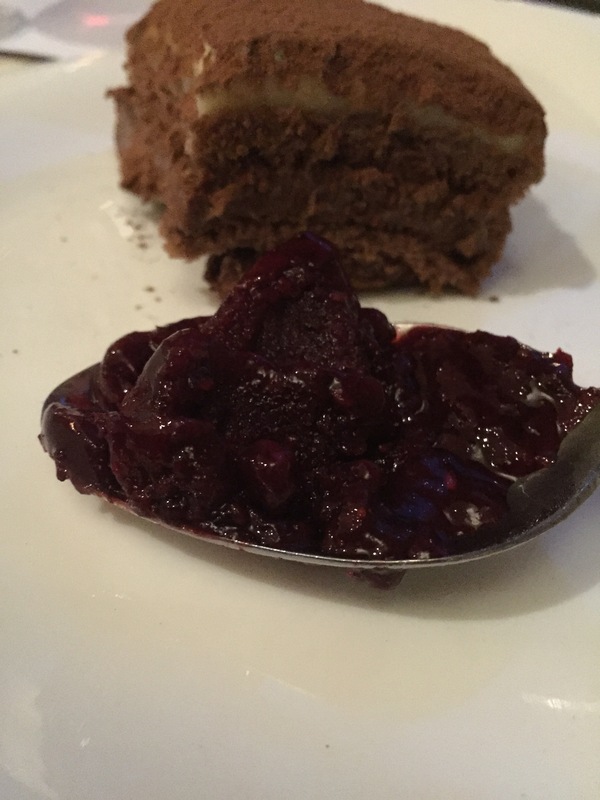 Mr Dillon chose most wisely by ordering the Triple Chocolate Mousse served with wild berry granita (€9) – this is a chocolate lovers dream with a delightfully light consistency. As we sipped on our teas and coffees, we felt like we had been away for an age. That’s what Faithlegg is all about – welcoming you in, nourishing you and sending you back out into the world refreshed. It’s so good to get away. « Dream It and Do It!